SMBs are looking for full-service partners that can drive their digital strategies, in part because they often don’t have the in-house talent necessary to go it on their own. As the rush to launch digital-transformation initiatives continues unabated in many large companies, smaller companies are probably thinking: What’s all the fuss? Don’t mistake that for indifference or an unwillingness to adapt to the realities of doing business in the digital age. 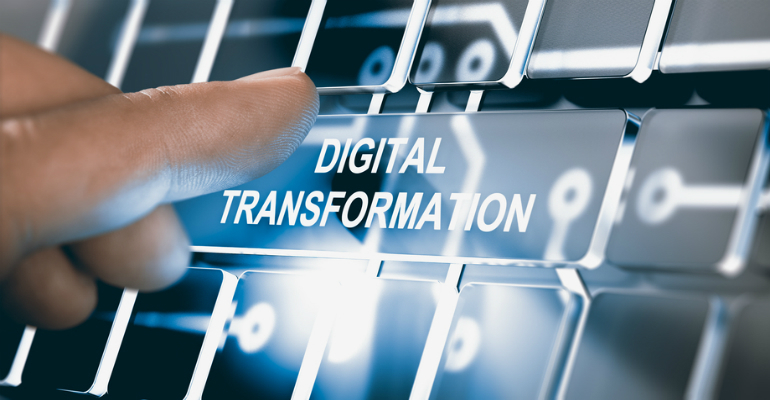 It’s just that “digital transformation” – or at least an early, organic stage of it – has been underway in many small and midsize businesses (SMBs) for the better part of a decade, says Techaisle principal analyst Anurag Agrawal, even if the folks running these firms (who also happen to make up a huge piece of the channel market) haven’t always called it that. The phrase “digital transformation” has picked up particular steam in the past couple of years, made hyper-popular in the business world by its widespread use in the media, in the analyst community and by IT vendors and suppliers. Agrawal points out that the roots of what we commonly call digital transformation today began for many SMBs at least six or seven years ago, fueled especially by exploding adoption of cloud services. This ushered in a truly transformative phase for SMBs operating with tight budgets and limited human resources. Launching a new digital product or service no longer required building out an expensive data center; a small sales team could use a robust CRM application without a multi-month, multimillion-dollar enterprise software project; teams distributed around the world could increasingly work together as if they were all huddled together in the same conference room. SMBs were better positioned than ever to complete on a large, global scale, pursuing new revenue streams and operational efficiencies that once might have been unthinkable. Why the brief history lesson? Because Agrawal sees a significant channel-partner opportunity in helping SMBs along in their ongoing digital transformations, beginning and achieving new initiatives, and perhaps especially in turning what might more accurately be called their “digitization” or “digitalization” to this point (more on the distinctions in a moment) into a true digital transformation. A recent Techaisle survey found that 43 percent of midsize companies (100-999 employees) see digital as important, but a small subset of broader strategic planning; another 12 percent see digital initiatives as siloed from the primary business. Techaisle found comparable numbers for small businesses with fewer than 100 workers — which is to say, there’s still a huge opportunity here. SMBs are looking for full-service partners that can drive their digital strategies, according to Agrawal, in part because they often don’t have the in-house talent necessary to go it on their own. The rub: Partners aren’t yet answering the bell. In Agrawal’s view, the traditional business models and practices or MSPs and other partners, which have typically been highly transactional or “productized,” aren’t a great fit for becoming a true digital-transformation partner. “SMBs are not able to find many channel partners who can enable that digital transformation that many of them are looking for,” Agrawal says. Partners have the technical chops and customer relationships to unlock the opportunity. It’s just that becoming a real digital-transformation leader, one that’s sought out by SMBs for its long-term (read: recurring revenue) services and expertise, might require some transformation of your own. Back to that history lesson: It speaks to a few larger truths about what digital transformation means to SMBs, and how they differ from the (much) larger organizations that so much of the buzz around digital transformation seems to generate. First, it seems like a fair question to ask: Is digital transformation a real thing, or is it just another overhyped tech trend? For SMBs and the partners that often serve their IT needs, Agrawal’s answer is very clear. That gets to a second reality: SMBs actually have an advantage over larger companies when it comes to digital transformation. That’s because they’re often the disruptors instead of the disrupted; they’re pursuing these initiatives from a position of strength, whereas many large enterprises are scrambling to implement digital-transformation projects out of fear of having their longstanding business models shredded by a younger, leaner – and, yes, digital – competitor. It’s that largest circle of digital transformation where the big opportunities still lie for partners — and odds are you’ve got some work to do to rise into a real position of leadership and value. You’re hardly to blame: Agrawal notes that most partners are challenged by the same constraints as their SMB customers, especially around budget and technical talent. But what successful partner has ever let such constraints stand in their way? 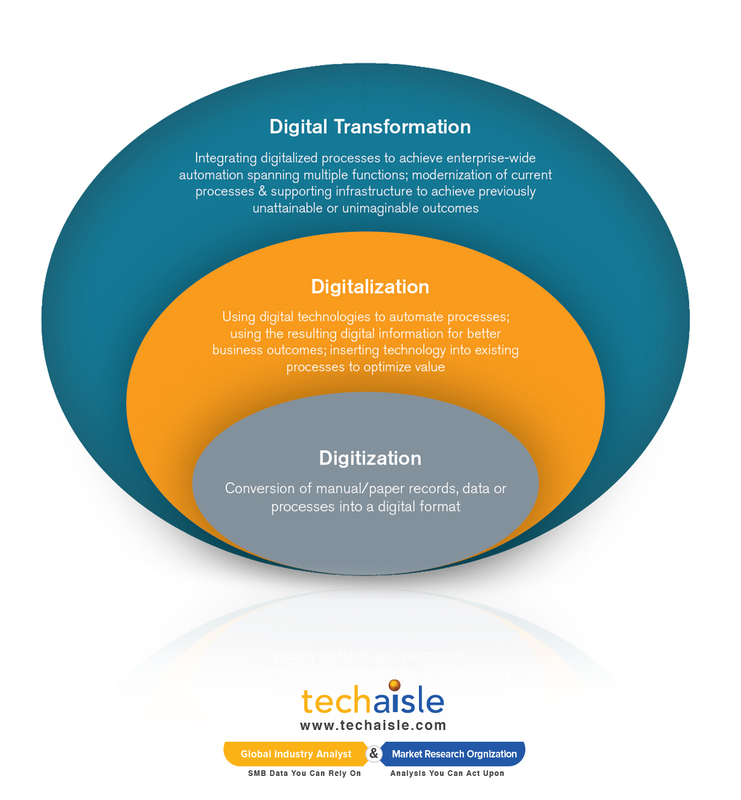 Agrawal believes there’s absolutely a path forward for partners to become digital-transformation leaders; in fact, Techaisle even published a white paper on the topic, one that begins with a “debate-style proposition: that digital transformation will benefit the reseller channel.” Its unmistakable conclusion: Yes, it will. To that end, though, partners that want to capitalize on those benefits will need to take certain steps, according to Agrawal. Partners will need to build digital transformation road maps — repeatable frameworks for helping customers achieve their goals. Connect, as a broad example, a customer’s incremental technology investments to the expanding circles of digitization, digitalization and digital transformation above. Start with a valued, receptive customer (or small set of customers) to develop the kind of understanding and expertise you’ll need to refine and scale those road maps. Invest in the skills and training your team will need to offer the full range of capabilities necessary to enable true digital transformation for clients. But heed your limitations: If you’re, say, an MSP with deep infrastructure expertise, but blind spots when it comes to developing a new digital product or service, consider partnering with other partners. Agrawal sees a huge opportunity in this approach — effectively, a super-team of partner businesses that become a digital-transformation powerhouse. Develop metrics or KPIs that help customers measure and understand the business outcomes of their digital-transformation initiatives. This helps partners both with existing client service but also with new business development: Being able to quantify your customers’ success stories helps position your business as a legitimate force, rather than someone simply slapping “digital transformation” on their website and other marketing collateral. Agrawal closes with a less modest proposal, one he recognizes might make some partners skittish, but that could help a few brave digital-transformation leaders stand out as elite. Sell an outcome-based revenue model. That effectively means: You get paid (or, at least, get paid more) when the customer succeeds (based on agreed-upon metrics or KPIs), rather than a guaranteed fee, as in a traditional professional-services model or similar contract. It’s most definitely a forward-looking idea, but one that underlines the current gap in the market: Digital transformation isn’t a transaction or a product or a single, recurring service; it’s about business goals and bottom-line results. Partners that really get that have seized upon a potentially transformative digital business model of their own.